Here are some shows taking place in the Minneapolis/St Paul area on June 11, 2016. One of our favorites, Blondie is playing an intimate show at the Minnesota Zoo this Saturday. I believe this show may be sold out (even at $70 a ticket), as I went to the venue’s website and they have taken off their ticket options. The Rock and Roll Hall of Famers is touring for their ‘Greatest Hits’ record Blondie 4(0)-Ever, available now. Andy Black (front man of Black Veil Brides) is currently touring in support of his debut record The Shadow Side, in stores now, courtesy of LAVA/Republic Records. Opening the show will be Colours, a duo consisting of Kyle Tamo on vocals and Morgan Alley on drums. Colours has been called “100 Bands You Need To Know” by Alternative Press. Their debut album Ivory is out now on Victory Records. The Avett Brothers (real life brothers Scott & Seth Avett) is headlining the Target Center in Minneapolis. Their latest True Sadness is available now on American/Republic Records. Special guest Brandi Carlile to open. Carlile’s The Firewatcher’s Daughter is out now on ATO Records. Here are some shows taking place in Minneapolis/St Paul from December 27 to December 31, 2014. Since the third week of December is the Christmas holiday, there actually aren't a lot of shows that are booked. Remember how I saw Hope Country and told you that his next appearance will be at the Quietdrive's show at the Varsity Theater? Well, that's this show, taking place December 27th. Hopkins-based Quietdrive formed in 2002 and apparently have done an Annual Holiday show since 2004 (as this is the band's 10th Annual Holiday Show). Their major label debut album When All That's Left Is You came out on 2006, but since 2009, have gone back to their independent roots. Their upcoming The Ghost of What You Used to Be is expected to come out digitally on December 16th, via Sneaker 2 Bombs. MN Express is a new program that took five Minnesota artists on a ten-day tour around the state in October 2014. Vocalist Aby Wolf, bassist Nick Gaudette, guitarist Kyle Sobczak, fiddler Sara Pajunen, and saxophonist Nathan Hanson, are the musicians participating in the inaugural MN Express tour. These songwriter/composers are all former participants of The Cedar's 416 Club Commissions Program which is funded by the Jerome Foundation and designed to support the creation of new works by Minnesota’s emerging artists. Each show was a unique collaborative performance that presented an evolved version of the artists’ commissioned works as well as new material created for the tour. Now, after touring Austin, Duluth, Grand Rapids, Morris, and Northfield, the MN Express comes home to The Cedar, and gives the Twin Cities a chance to see what their outstate neighbors have been enjoying! This activity is made possible by the voters of Minnesota through a grant from the Minnesota State Arts Board, thanks to a legislative appropriation from the arts and culture heritage fund. As you heard on our latest podcast, I've mentioned how much I love New Order... and any New Order fan might know that this weekly Monday night dance club's name Blue Monday is taken from one of New Order's most popular songs. Blue Monday is a weekly dance night hosted by the Triple Rock Social Club and Patrick Donohoe (CLAPS) and Benjamin Jones (TFATT) every Monday. Blue Monday features a mix of classic 80’s dance and New Wave hits. From ABC to Xymox a little something for everyone who loves to dance. BLUE MONDAY (every Monday at the Triple Rock). Trivia #1: Blue Mondays is a Minneapolis New Order tribute band. Trivia #2: The cover art used here is lifted from The Smiths' Meat is Murder, which in turn was a still taken from the 1969 film Year of the Pig. I'll never forget the first time I saw Amy Ray in 2008, Brandi Carlile just randomly showed up at the show! I want to say that starting in 2012, these Brandi Carlile holiday shows have been very successful. Even at general admission of $65 per ticket for 12/30 and $100 for 12/31, both shows sold out. Celebrate the end of 2014 with Poliça and Marijuana Deathsquads... that is if you were lucky enough to have purchased tickets before it sold out. The show was announced November 11th, and by the 14th, all tickets were all gone. Earlier in October, Poliça released the Raw Exit 10" on Mom+Pop, the 10" is the physical compliment to the Shulamith (Deluxe Edition) and featured 4 brand new tracks. If you already own , no problem, the tracks are available as individual downloads. It's that time of the year again, Black Friday. Like last year, it's more like Black Thursday, as Kmart, Walmart and are opening their doors at 12am, 6pm, and 8pm, respectively. The truth is, I would ideally like to get these things, but often I ended up not getting them because they are out of stock or they sometime offer other (unadvertised) deals. We'll see how this plays out, but I'd just be happy if I can get the Last of Us video game for that price. This year, Target's Black Friday deals aren't very good - with selections that doesn't appeal to me at all. They also seem to concentrate on the higher-ticketed items. I don't really need it, but the iPod 5th Generation is on sale for $179 ($229 minus $50 Target Gift Card) looks mighty tempting. Best Buy is only advertising DVDs for their television sales. I'm only interested in Blurays, but like many of these things, I won't know it until I see it in the stores. Dale Earnhardt Jr. Jr. will be releasing a special Black Friday Black Vinyl edition of their record The Speed of Things. The standard edition was released earlier in October via Warner Bros. Details about the Black Friday Vinyl is that it's limited to only 3000 copies, and will be on sale Friday, November 29th. After wrapping up a string of dates with Atlas Genius, the band will begin their headlining tour in 2014 (dates with * indicates with support from Chad Valley). A limited run of The Lone Bellow/Brandi Carlile split 7" orange vinyl will be released on Black Friday, November 29th in celebration of Record Store Day via Descendant Records. The split 7"includes two tracks (Carlile's "Raise Hell" and The Lone Bellow's "You Never Need Nobody") from fan favorites during the time the bands toured together. The Lone Bellow are currently out on a headlining tour with Aoife O'Donovan, and Ivan & Aloysha ending on The Late, Late show with Craig Ferguson on Dec. 13th. They've already sold out their California tour dates! Secret Stash Records, the label based out of Minneapolis and specializing in collectible vinyls is releasing a very limited pressing of Peter King's Omo Lewa with Coke bottle green vinyl with pink splatter. The 12" is on sale this Friday November 29th. The record is a followup to their re-issue of King's African Dialects, and bringing back these rare Orbitone Records back into print. NOTE: Only the first 350 copies come on limited edition coke bottle green vinyl with pink splatter, so act fast if you really need it. The standard edition LP and CD versions of this title won't be available until January 21, 2014. It was a great crowd that showed up last night at the Fine Line Cafe to see Indigo Girls' Amy Ray. Even Ray acknowledged the good turnout before playing "She's Got to Be." Arizona (they're actually from North Carolina) was the opening act; they did a great job warming up the crowd and ended their set with "Whiskey Or Wine." 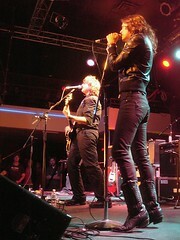 But before they left the stage, Amy Ray joined them to play a song and this got the crowd to immediately move forward. Amy Ray's band is like an all-star cast with Butchies' Kaia Wilson (guitarist), Melissa York (drums), Julie Wolf (keys) and I didn't catch the bassist's name, but he's from Minneapolis. After the first few songs, the band is joined on stage by none other than Brandi Carlile! Carlile actually sang backup on many of Ray's songs, including the encores. I suppose she's currently on tour with Amy Ray? Carlile is set to tour overseas in Portugal and Switzerland in mid-November. Ray rocked out Fine Line to her huge following, who could not get enough of Ray! The crowd was especially receptive to "SLC Radio". An interesting highlight was when Kaia Wilson sang a song she wrote when her dog, Basket, caught an animal. Didn't It Feel Kinder is out now on Ray's own non-profit label, Daemon Records. Be sure to check out Amy Ray on tour, all the guest appearances will make it worth your time! Starting in November, Jennifer O’Connor joins Ray on tour, so that should be even better! Speaking of ridiculously hot, the first time I saw a picture of Brandi Carlile, I knew I was in love. She had shorter hair back then and had a boyish charm to her looks, reminiscent of Louise Wener (here's an example). She recently released her iTunes-only EP called Live from Boston, and it was a real pleasure to listen to. Of the four songs, I thought "The Story" was easily, easily the best. Her emotionally charged lyrics is best experienced live. By the way, a close second was her Johnny Cash cover "Folsom Prison Blues". You can purchase the EP via iTunes only, the most popular digital music store, so chances are, you probably already have an account. Incidentally, the reason why the 4-track is listed at $4.99, it is because it comes bundled with a video for "Josephine". As a bonus, enjoy her cover version of Radiohead's "Creep", recorded at The All About The Music Festival 2006. If you like what you heard, you can buy a superior recording from the same Live in Boston set via iTunes. Released last week (Sep 23th), the Safes' Sight of All Light EP are a great mix of rock n roller. Rolling Stones calls it "Atomic Pop", while Paste Magazine compares them to The Kinks and The Who... so apparently the popular press loves these guys. The five-track fourth Safes release does start off strong and rocking, especially with the first track, "Sight of All Light". It looks like, starting in October, they are heading out for a national tour, be sure to check them out. Mark Williams didn't give me much to work with. The EP is a five-track CD-R with no album artwork. No offense to anyone, but I have different priorities when it comes to music reviews and CD-R, demos, & MP3s are at the bottom of my list. I will mention that there was something in the package that did make me take a notice: there was a Lipton Herbal Peach Tea. I'm not saying to bribe me, but it was one of those WTF moment. So, his EP is called Shallow Eyes. I could not find any album artwork online, so I'm using a picture of his band. The whole EP has a Motion City Soundtrack feel to it, but slower. I would even bet Shallow Eyes would sound better live than what's on recording. I see a lot of potential in Williams, he's only 16, right now, it should be interesting to watch him as he grows up, and perhaps take up a different musical direction. Whatever it takes for me to be a lifetime musician, that’s what I’m going to do. People tells me that they discover new music "Grey's Anatomy". I mean, who looks for new music on television shows? Well apparently it does work, and Interscope Records invested in having Bryn Christopher's "The Quest" to appear on an upcoming season of Grey's - so watch for it if you're already a fan of the show. "The Quest" is a lead-in single (released September 16th) to his January 13th, 2009 album called My World, and if the song is any indication I would have to guess that the album is pop/soul. If you like that genre, you definitely need to give "The Quest" a listen. The story I got out of the Quest was that he wrote the song on his mobile phone, and is about his brother's experience as a solider in Basra.